Samsung announces Galaxy Win | Android Blast! Samsung has officially announced the Samsung Galaxy Win. The Galaxy Win will be a mid range phone, but will have one important new feature. It will come in a Dual-SIM variant. The US is so far behind the times with our single SIM phones so we probably won't see the Dual-SIM version. Oh well. 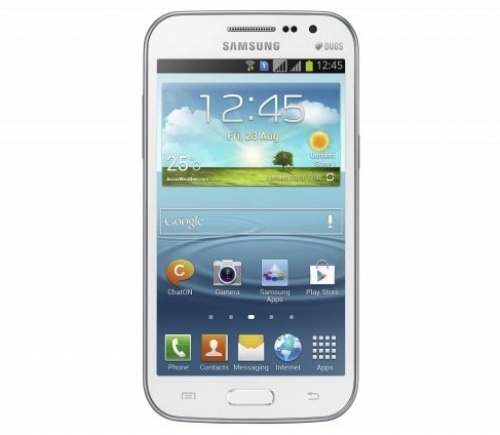 As a unique and practical option for mobile users, the GALAXY Win is equipped to handle demanding tasks while still providing an effortless user experience with intuitive features including dual SIM support for a seamless work and life balance, a large display for optimal viewing, Easy Mode for simple access to most used functions, and many more. Designed to provide the best in mobile technology that can easily fit in your pocket, the Samsung GALAXY Win is powered by AndroidTM (Jelly Bean) and comes equipped with powerful hardware that makes both gaming and multi-media easy. With a 1.2GHz quad core processor and a 4.7 inch display, there is no app or game that the GALAXY Win can�t run with vivid color and resolution. The 5-megapixel camera is equipped with multiple features including Continuous Shot, Best Photo, and multiple color effects to make taking high-quality photos fun and easy. The GALAXY Win also allows users to enjoy extended multimedia use and longer talk time with 8GB of internal storage and a 2,000mAh battery. The WIn resembles the rest of the Galaxy line, but will be a bit more "pocketable." With a 4.7 inch display it will be more reasonable to hold than the S4 or Note. Samsung is definitely attacking every price point in the smartphone market these days.